This is a sector that the Chinese government wants to open up under its One Belt, One Road initiative, to enhance social and economic links between Laos and China. There will be three weekly flights: departing from Vientiane to Haikou city in Hainan province on Wednesdays and Sundays and from Luang Prabang on Fridays. Speaking at the Laos-Hainan Tourism Resources Promotion and Symposium in Hainan province on Monday, Deputy Director General of Laos’ Tourism Promotion Department, Ms Sengsouda Vanthanouvong, said Laos and China had a long history of relations and cooperation. The new flight route was an additional milestone in further promoting tourism between the two countries. “This not only represents tourism cooperation between Laos and China; it is also a bridge to link our two governments and peoples to improve economic and other important areas in the future,” Ms Sengsouda said. Hainan province is located in the south of China and has a similar climate to Laos. It is considered a gem in China’s tourism industry but is unknown to many people in Laos and other neighbouring countries. The new route is one of over 50 flights around the world that will promote tourism and cooperation with the province. Chairman and General Manager of the Hainan United Airlines Travel Group Company Limited, Mr Ding Jiabin, said Vientiane and Hainan province would be brought much closer as the flight time was only one hour and 30 minutes. “Because of the One Belt, One Road initiative, it is the Chinese government’s policy to set up flights from Laos to Hainan province to enhance the development of our two countries,” he said. Travel not only helped to boost trade and the economy, it also helped to develop other areas such as education and business, he added. “For Lao people we have special incentives for them to travel here or come here to work in different areas,” Mr Ding said. According to the Hainan tourism sector, the number of Chinese nationals travelling to Laos is increasing every year but the number of people going from Laos to Hainan is small in comparison. He urged more people to visit and enjoy the province’s splendours such as the beautiful sea, and to take advantage of the new direct flights. Deputy Director of the Haikou Tourism Development Commission, Mr Wen Delin, said Laos and China were brothers and were tightening cooperation in many areas. Tourism was one of the main fields that the two governments were aiming to develop. “Hainan is located in Kuang Dong prefecture, close to Macau and Hong Kong, so the recent policy to build a free economic port here will develop the city and thanks to closer cooperation Laos will also benefit from this,” Mr Delin said. About 20 delegations from various government sectors and provincial businesses associated with tourism in Laos were invited to the signing ceremony. 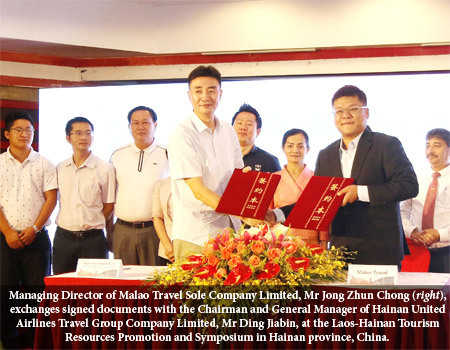 At the close of the ceremony, Managing Director of Malao Travel Sole Company Limited, Mr Jong Zhun Chong from Laos, signed the agreement with the Chairman and General Manager of Hainan United Airlines Travel Group Company Limited, Mr Ding Jiabin. After Lao Airlines began direct flights between Vientiane and Changsha, the capital of Hunan province, in 2015, the province expects to begin direct flights between Luang Prabang province and Changsha starting next month.